The Metalcloak Jeep JL Wrangler 3.5" Rear True Dual Rate™ Coils are manufactured specifically for the Jeep JL Wrangler. Hi-tensile chrome silicon steel alloy is used surpassing the "typical" aftermarket coil spring in performance. MetalCloaks JL Wrangler springs exceed your expectations in every way -- extended length, ride quality, stability, and long-lasting durability. One of the Longest Free Length in Industry: 18"
Note: MetalCloak does not recommend powder coating your True Dual Rate Coils. The baking process in aftermarket powder coating can, in some cases, cause the metallurgical properties of the coils to be changed, resulting in the loss of the lift properties of the coils. As such, the process of powder coating the coils will void any warranty stated or implied in relation to the coils. MetalCloak JL Wrangler True Dual Rate™ Coils have one of the longest free length in the industry for greater articulation without sacrificing the OEM ride quality. 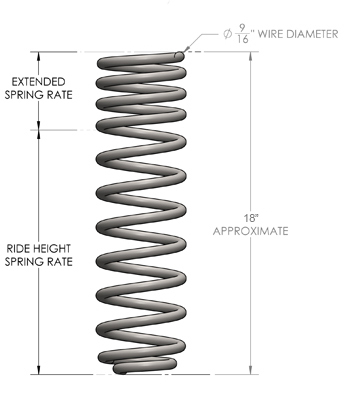 Without the advantage of the Dual Rate Design, the required Spring Rate would be too low and "squishy" -- just loading your Jeep up with supplies would affect ride height and quality. By effectively lowering the bucket on the coil, you get a much more stable ride that reduces the potential for buckling.